At the heart of Cafe Artysans’ ethos is sustainability, not only to local suppliers but also to the local community. 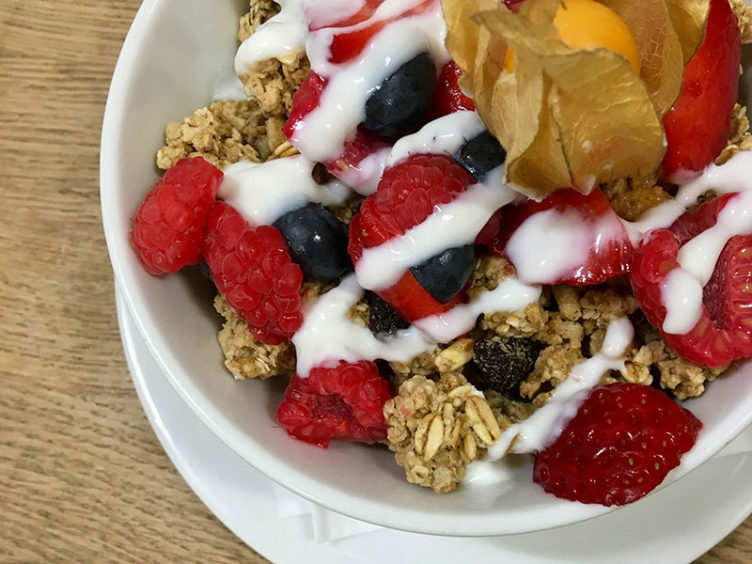 As well as our popular lunch, we also offer a range of delicious breakfast options, including our full Scottish breakfast, granola with yoghurt (pictured) and fruit and the classic bacon roll. Cafe Artysans is part of Calman Trust, working with young people to discover their future. Every penny made through the café is invested in improving the life chances of young people in the Highlands. *For more information, you can visit the Café Arysans website by clicking here or follow them on Facebook here. 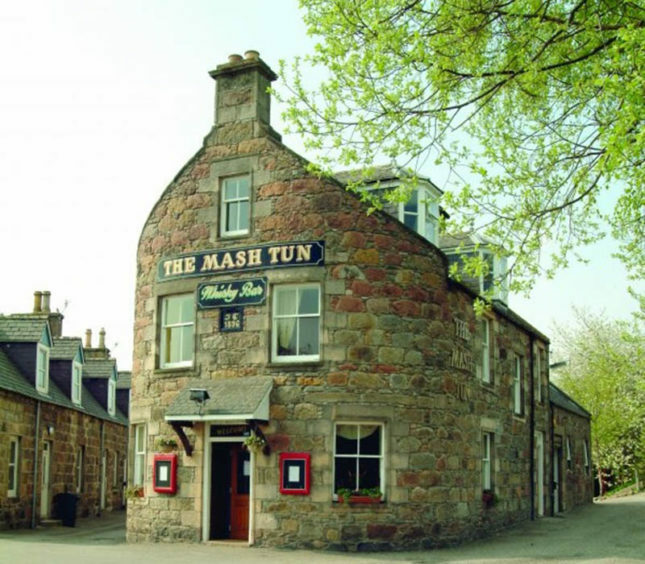 On the banks of the River Spey is a whisky bar well worth a visit – The Mash Tun which is located in the beautiful village of Aberlour in the heart of Scotland’s Malt Whisky Trail. Run by Mark and Karen Braidwood, the Mash Tun not only specialises in malt whisky, but also prodies itself in serving great quality food. You are invited to pop into the whisky bar, and sample some of the delicious locally-sourced food on offer, and then why not extend your stay by booking one of the five recently refurbished whisky themed rooms above? Named after local whisky distilleries, the rooms are individual and comfortable. Take advantage of the Mash Tun’s Weekly Stay Special offer, which is available throughout 2018, or stay seven nights and pay for only six. You will find the Mash Tun at 8 Broomfield Square housed in famous building that was once home to the Station Bar and dates back to the late 19th century. Interestingly, the building was designed to replicate a small ship and today is named after the large vat which is used in whisky distilling. *To book your stay at the Mash Tun visit its website by clicking here, or call 01340 881771. You can also book online at Private House Stays. 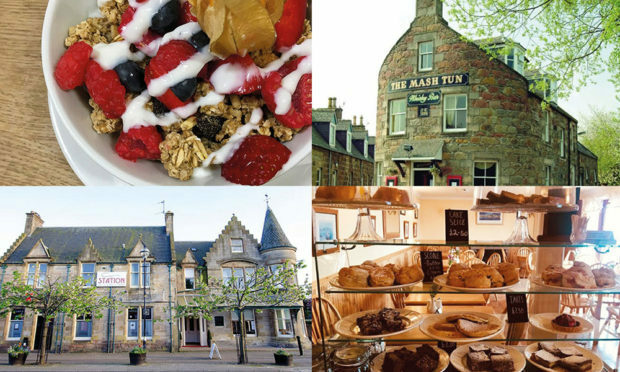 The White Cottage Tearoom and B&B is located in North Kessock and is so much more than a tearoom, as you will discover. A quality menu sets this apart from its competitors – for example, you won’t see many other ‘tearooms’ with grilled scallop and king prawns with quinoa beetroot salads on its menu – and this is something new owners Stuart and Andrea are particularly proud of. Each week there are specials, like the tasty Ardgay venison burger, and if you fancy trying its traditional fish and chips then you will be helping a local good cause, as 50p of each dish purchased goes directly to the RNLI Charity. No tearoom would be complete without an Afternoon Tea, and at the White Cottage this is no exception. Traditional Afternoon Teas are often over-priced, but not here, where you can enjoy a selection of sandwiches, cakes, and scones (complete with the chef’s homemade jam), along with filter coffee or breakfast tea for just £10.95 per person, or £20 for 2 people (this is served Tuesday to Sunday). Have you tried Earl Grey & lemon cake? This is served at the White Cottage as well as banana loaf, cranberry flapjacks and millionaires’ shortbread; these are just some of the tasty treats that keep the visitors coming back. And of course, you can stay as long as you wish, as overnight accommodation is available at the B&B. This is just another reason to visit the White Cottage. *For more information, visit the White Cottage’s Facebook page, by clicking here. 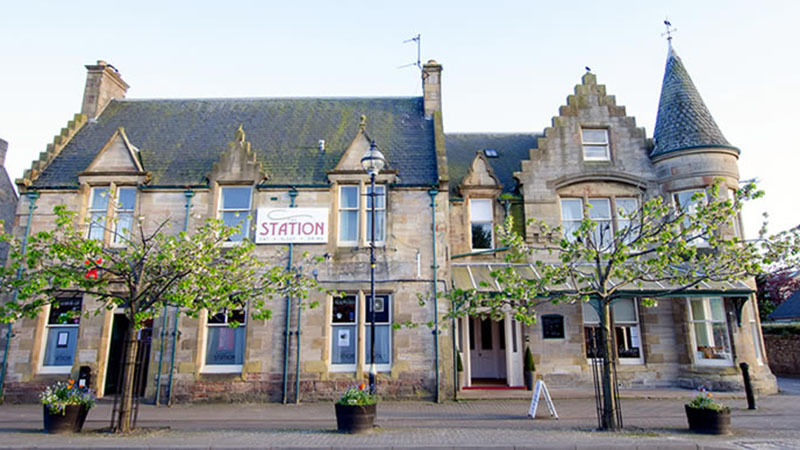 A warm welcome awaits you when you visit the Station Hotel in Alness, whether for accommodation, a light snack or a superb meal from its excellent kitchen. This historic hotel is situated on Alness High Street in Alness, Easter Ross, and is well wort a visit. The town itself has repeatedly been winners of the Royal Horticultural Society’s (RHS) Britain in Bloom and many other floral awards, including Beautiful Scotland, and is also located on Scotland’s answer to Route 66, the famous North Coast 500. Plus, accommodation in Alness is much cheaper than the nearby Inverness. The hotel itself prides itself in producing an extensive menu of succulent meals from locally produced ingredients. The Station Hotel’s Sunday Carvery is legendary! Meals are served by experienced and chatty waiting staff who are a mine of local information. And while visiting Alness why not treat yourself to Afternoon Tea at the Station? 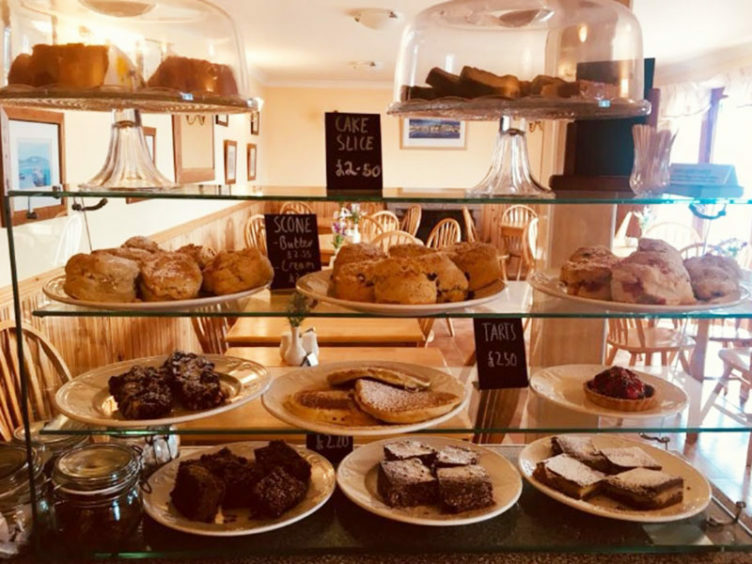 The Afternoon Teas are unbelievably delicious and include sandwiches, savoury nibbles, scones and a wide selection of Scottish homemade baking. The restaurant is open until 8.00pm through the week and until 10pm on Fridays and Saturdays (or later by arrangement). You can visit the Station Hotel website by clicking here.